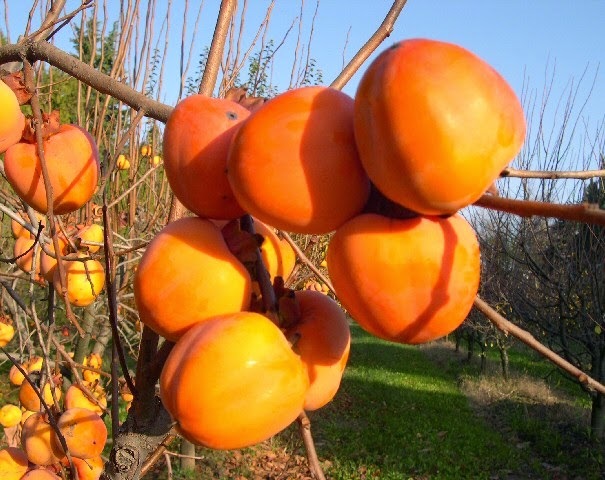 Otherwise known as the Japanese persimmon, the hardy Sharon fruit - Diospyros kaki is a deciduous fruit tree rarely grown in the gardens of English, due in part to its strong association with far warmer mediterranean and Asian climates. 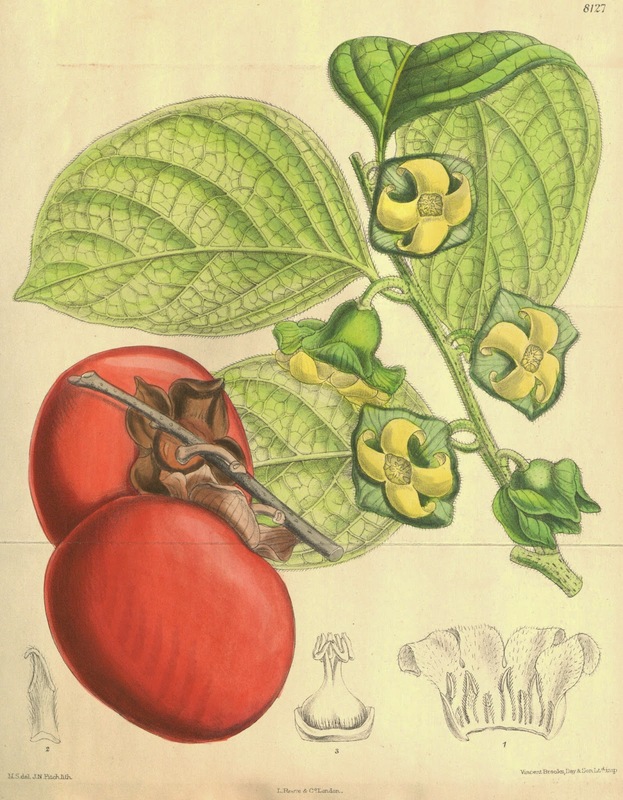 Be that as it may, it is the most widely cultivated species within the Diospyros genus and is among some of the oldest crops still in cultivation. In fact its use has been recorded as far back as 2000 years in China. The Sharon fruit tree is considered to be either a large shrub or a small tree, and grown for its edible, orange-yellow tomato shaped fruits. The flowers are diecious, not particularly showy, and appear in the spring. The female blooms are a creamy white while the males emerge pink. However as an ornamental tree is should alway be considered a worthy garden plant if only for the large, exotic and lustrous leaves and their glorious orange-yellow to orange-red and plum-purple coloured autumn-effect foliage. Should you chose to, the brightly coloured fruit can be left unharvested on the tree as a decorative effect. Alternatively harvest the fruits when the skins reach a deep orange colour. When growing the Sharon fruit in a more northern European garden it will need a sunny position, sheltered from northerly and easterly winds. It will grow best in a deep, moist, slightly acidic and well-drained loamy soil. However while it is surprisingly tolerant of varying soil types, it will prefer moist, sandy soils. Water during its first year, particularly during periods of drought or high temperatures. However once established it is reasonably drought tolerant. Avoid planting Sharon fruit trees in heavy soils or those soils which are prone to waterlogging. The Sharon fruit is prone to root sucker. These should be removed unless a naturalized effect is desired. CAN YOU EAT SEA BUCKTHORN BERRIES? I am trying to grow these from seed. So far I have two that have taken one is 2 years (approx 1.5 ft tall) and the other is 1 year (approx 6 inches) they've been going great but the last three months they have had leaves discolouring and dropping. I keep them indoors in a warm South facing room, but due to the discolouring I moved them to a cooler room about 5 degrees and North facing. I don't water them often unless the overflow trays are dry. It's it the overflow yay causing a problem as I have read that they don't like damp soil? I would appreciate the guidance as they are very hard to find information on.